Background: This paper presents a compensation technique to improve the efficiency of a microgrid (MG) in the distribution system. 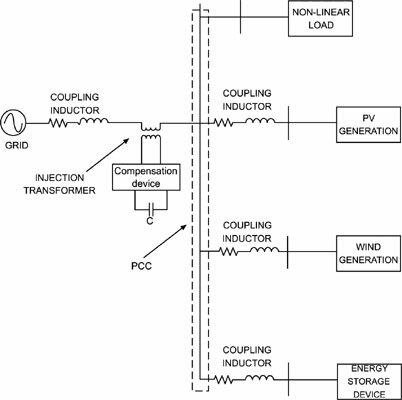 Methods: A Direct-Quadrature (D-Q) based compensation technique is proposed to mitigate the power quality issues in Microgrid on the load side. The proposed model is used to control and balance the power generation to load demand in MG under different loading conditions. Renewable Energy Source (RES) Photovoltaic (PV) and Wind based generations are considered as two micro generations and are integrated with the conventional power system. Result: The proposed model can be used as plug and play mode operation of MG. Conclusion: The performance of proposed compensation techniques is analyzed in the MATLAB / Simulink environment and the simulation results exhibit satisfactory controller action. Distribution generation system, maximum power point tracking, total harmonic distortion, point of common coupling, space vector PWM, fuzzy logic control.